T. Peyton Bell, an Augusta native, is an associate at Harris Lowry Manton LLP, where he focuses his practice on product liability, wrongful death, personal injury and business torts. 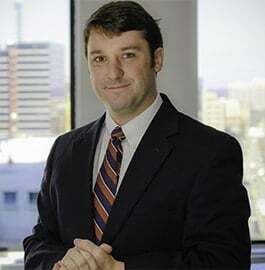 A graduate of the University of Georgia Law School, Peyton previously worked for an insurance defense law firm. This gives him a unique advantage when handling claims for injury clients, because he can anticipate how the opposing counsel will build its case. Peyton is an active member of the Georgia Trial Lawyers Association, State Bar of Georgia, and American Association for Justice. During his time in law school, Peyton served as a legal extern for Western Judicial Circuit Superior Court Judge Lawton E. Stephens and as a research assistant to several professors. Peyton also competed on the Georgia Law mock trial team, was elected President of the University of Georgia’s Graduate Student Association, and was awarded the William King Meadow Award, which is presented to the graduating student who best exemplifies the integrity, sense of responsibility, and high standards of the legal profession and who has the keen sense of humor necessary to afford a proper human perspective to the resolution of legal problems. Before law school, Peyton served as a Legislative Assistant and Press Secretary for U.S. Congressman John Barrow, who represented a large portion of East and South Georgia. These experiences gave Peyton an in-depth understanding of not only the justice system, but the legislative process which informs it. When not in the office, Peyton can be found training for his next triathlon, or honing his public speaking skills by taking improv classes at Dad’s Garage Theatre Company in Atlanta. Peyton and his wife, Kate, are members at Second Ponce De Leon Baptist Church, where he serves on the local missions council.